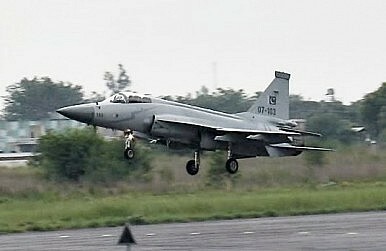 According to local media, Myanmar will become the first foreign purchaser of the Sino-Pakistan jointly produced fighter. Myanmar will purchase the Sino-Pakistan jointly produced JF-17 Thunder multirole fighter aircraft, according to local news reports. According to the Burma Times, Myanmar is looking to purchase a license to domestically produce the J-17 aircraft, which is called the FC-1 Xiaolong in China. If the report is accurate, it would make Myanmar the first foreign purchaser of the jet. Currently, only Pakistan’s Air Force operates the J-17 and, as Ankit has reported, Islamabad is in the process of making a number of upgrades to the fighter jet. Although the report is unconfirmed, it is extremely plausible. To begin with, Myanmar has previously operated or currently operates a number of Chinese-made aircraft including: 48 NAMC A-5C fighters, 52 Chengdu F-7M Airguard fighters and 4 Y-8 medium lift transports. The Southeast Asian nation’s air force also recently purchased Sky 02A Unmanned Aerial Vehicles (UAVs) from China, and built domestic copies of them. Myanmar also reportedly considered purchasing the JF-17 a few years back before ultimately deciding to buy Russian-made Mi-29s. However, the Burma Times report said that Rangoon’s aircraft has suffered from serviceability issues in recent years, and thus a locally assembled aircraft like the J-17 would make sense. Myanmar is likely to use the JF-17 jets in part to help combat the Kachin Independence Army (KIA) insurgency in northern Myanmar. The purchase of the JF-17 will also help Myanmar keep parity with neighboring Bangladesh, which is expected to expand its air force in the coming years through the purchase of Russian or Chinese-made aircraft. Bangladesh has reportedly been offered and rejected the JF-17. The report failed to indicate whether Myanmar will look to purchase the Block I or Block II of the J-17s, but it did note that the former is priced at $20 million per unit while the latter is going for $25 million. Sri Lanka and Pakistan agreed to the deal on the second of day of Prime Minister Nawaz Sharif’s visit to Colombo.